A gopura with entrance in the middle leads us to the inner prakara. On either side of the gopura a huge compound wall extends to the north and the south and turns towards the west and adjoins the mother rock. The wall does not end adjoining the mother rock instead it elevates above the hillock as a fence around the rock cut temple. It also forms the ambulatory wall of the inner prakara. The two-tier gopura is of sala type. In order to raise the height of the structure, it has a two-storied basement. 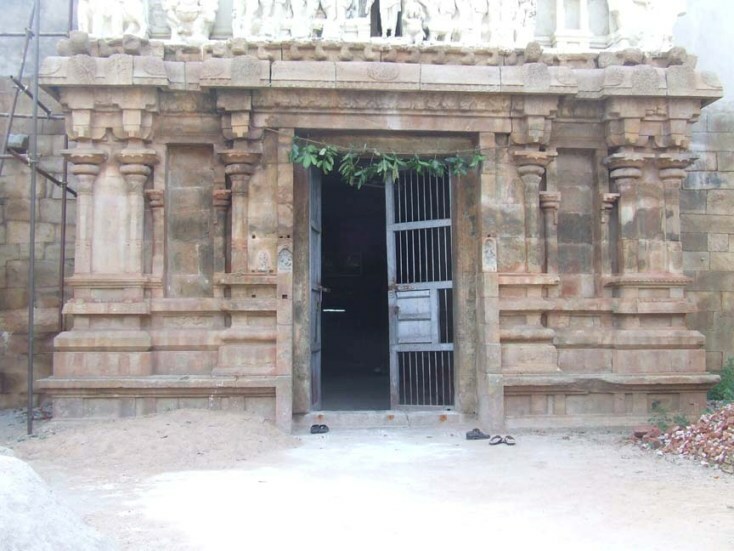 The upapitha forms the lower basement and above it raises the formal basement. The characteristic feature of this gopura basement is variations shown in the divisions. The gopura is divided into three projected segments as Karna patthis on both ends and salabhadra with entrance in the middle. In between the sala and karna patthis are shown the niches. The gopura has vargabedha adhisthana. The karna patthis have kapotabandha adhisthana where as the sala bhadra is adorned with padabandha adhisthana. The kapotabandha adhisthana of karna patthis starts with jagadhi, octagonal kumuda, gala complex and kapota with kudu arches and yazhi vari, whereas the components of padabandha adhisthana are upana as inverted padma, jagadhi, rudra kumuda, gala complex and pattika. On either side of the rudra kumuda is the padmavari. Miniature sculptures of yazhi are shown in the kanda of recessions. Above the adhisthana is the vedika with vedikanda and vedika proper. The component of karnapatthis is decorated as urdhva padma whereas it is shown as kapota with kudu arches in the sala section. Above the vedika raises the wall with six pilasters, two pilasters adorns each section. The pilasters possess a square base with nagabandha in the corners and scrolls on its faces. Above the base raises the vishnukanta shaft with the usual upper elements from mala to veerakanda. An interesting feature to note on the northern karnapatthi pilasters are the micro bas-relief figures carved on the stana portion of the pilasters. The corbels above the pilasters are vettu and taranga in style. The hands of the corbels rise above to hold the roof elements. The valabhi is adorned with bhutavari and the kapota with kudu arches. Provision is also left for kodikarukku in the corners. Some of the kudus are unfinished and the festoons are not shown flowing from the makara heads in the yazhi vari. Above the kapota is the bhumidesa with yazhi vari. The ridge of the kapota is adorned with canda mala. As concerned with the split pilasters of the niches possess the rudra shaft with same ornamental upper features. Above the palakha the virakanda bears the lintel. The middle pair of pilasters flanking the entrance in the sala section are simply brahmakanta in type. 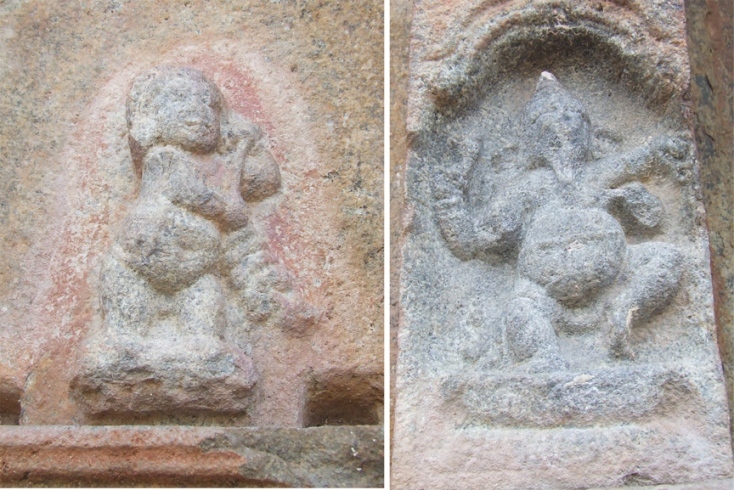 On both the pilasters miniature sculptures of Ganesa and Bhairava are seen. To the right of the entrance is Ganesa in dancing posture and to the left of the entrance is the Bhairava in standing posture. Bhutagana another miniature figure is seen to the right of Ganesa in the wall section. The doorframes are cut little inside the entrance, which has huge wooden doors. 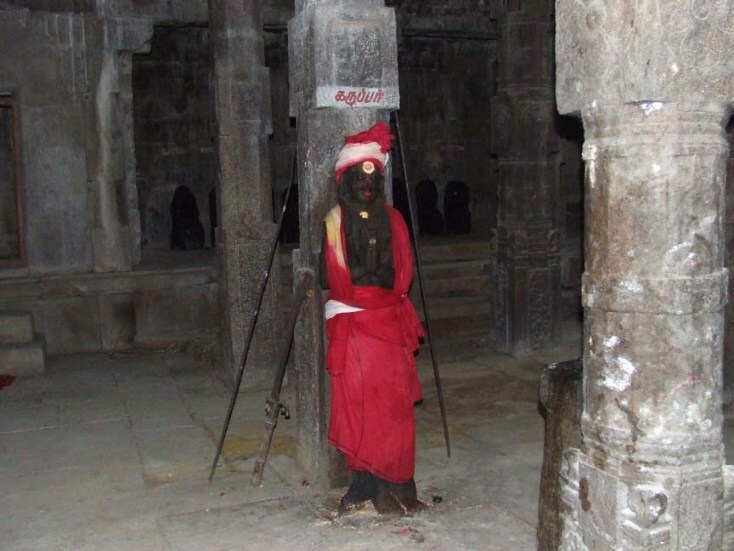 The bhutavari in the gopura is an interesting feature to note. Unlike the usual depiction of bhutaganas with musical instruments here they are mostly depicted in fighting posture with weapons like sword and shield. Both male and female are seen. Some are with musical instruments like string, conch and cymbals. Apart from the bhutas miniatures of Krishna with flute and animal figures listening to his music, linga with cow are also seen. Above the roof is the newly constructed tower of sala gopura. The entrance in the middle of the gopura leads us to the inner prakara. It is a pillared hall with the ambulation on east, north and south. The Thiruchuttru maliga starts with the gopura and run a few yards on the south and turn towards west and ends adjoining the mother rock. The ambulatory portion has a raised platform, which is shown as an additional basement above which raises a row of pillars in the facade. Except the first pillar near the gopura all the other pillars are simple with squares at ends and middle and kattu in between the squares. The potikas above these pillars are angular with vettu and taranga and holds the beam, which is shown as uttira, vajana and valabhi. The first pillar seen near the gopura is the only ornate pillar of southern ambulation. It bears the name of the sponsor. An interesting feature to note in this pillar is that a messy attempt is seen on its apex. It is a double pillar with one portion shown as squares and kattus whereas the adjoining pillar with ornate features. Instead of three squares only two is seen with regular intervals. The third square that is partially visible on the top is arranged on an irregular interval. It is clear that the upper square is altered as kattu. This may have happened due to some miscalculation by the sculptor. The adjoining pillar has a brahmakanta shaft with the ornate upper features. The shaft is decorated with miniature carvings. Above the palakha a lion is shown standing by bearing the potika on its head. The potika is also unfinished to which only the nanudal is visible. The ambulation in the south has three rooms in it. The room that found on the southeast corner might be the kitchen. Both on the east and west stairs arrangement to this ambulation is found. Unlike the southern side the pillared mandapa on the north has an uncovered muddy space left out for garden and a huge jack tree occupying it. 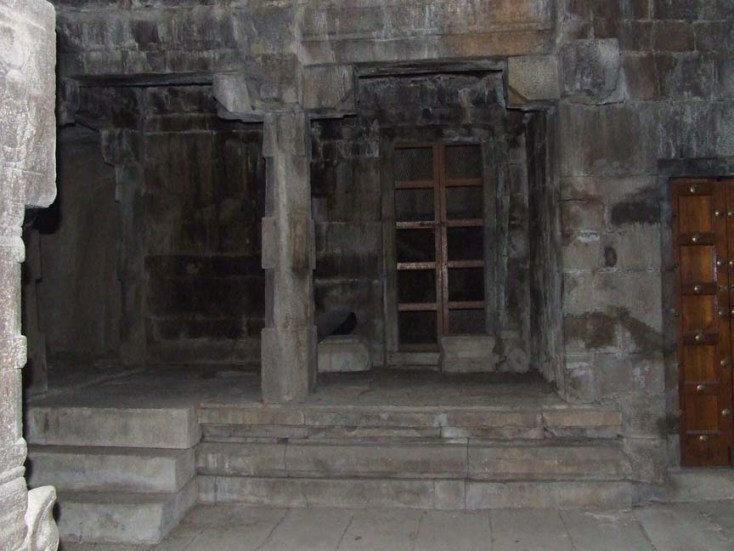 The pillared mandapa is not left open whereas iron gates enclose it. The thiruchuttru malika is shown both on the mandapa portion and the garden portion. The thiruchuttru malika shown within the mandapa occupies a vast area with two rooms facing south. It ends on the northeast corner adjoining the gopura wall. It has a flight of three steps on the west enclosed by parapet walls with makara heads and wavy trunk forming the ridges of the wall. Three pillars are shown in this ambulation, which are ornate with squares at corners and middle and indrakattu in between them. Other decorative features like nagabanda, miniatures and medallions decks the pillars. The corbels above the pillars are madalai and nanudal bearing the roof beams, which are shown as uttira, vajana and valabhi. 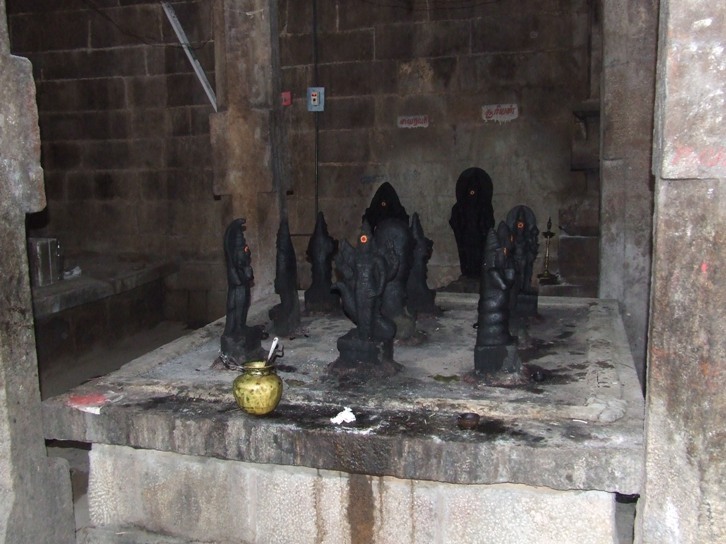 The thiruchuttru shown on the open space has two rows of simple pillars and the potikas above them are angular with vettu and taranga. 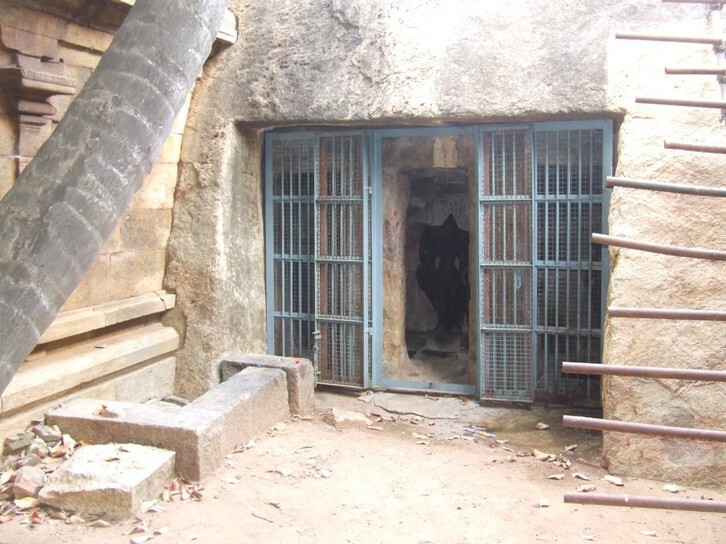 The raised platform of the entire thiruchutru is shown as an additional basement except on southwest where it is shown as a padabanda basement. The saptamatrikas with virabadra and ganesa is seen on the southern side of the thiruchutru. The pillared mandapa, which is of later addition, has a wall in the middle extending in north south direction dividing the mandapa into two sections. The wall has an entrance in the middle and does not extend to full length on the southern side where it partly cuts and extend towards west. The pillars are massive and huge in size. 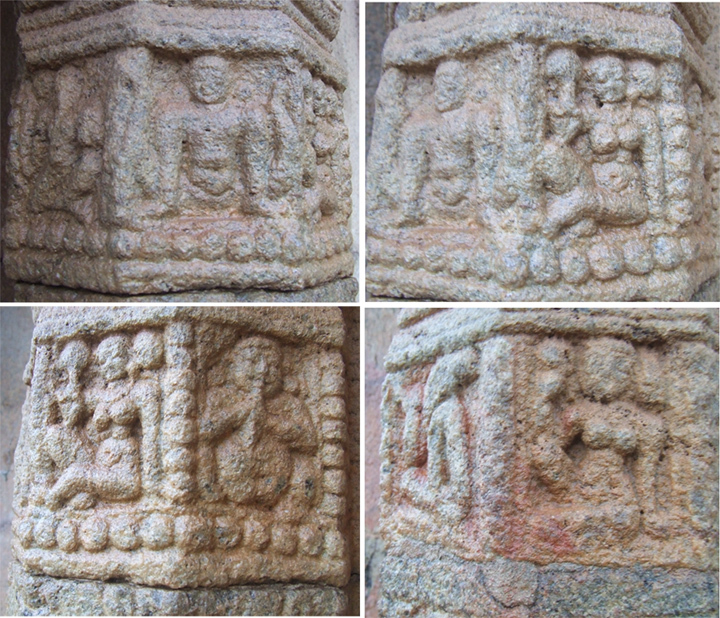 Some of the pillars are plain with simple squares and kattus, whereas some are ornate with motifs in the faces. Most of the pillars on the southern side of the mandapa are unfinished with squares and kattus to which some has long base. The faces of the squares are rough and unfinished where provisions left to inscribe motifs. 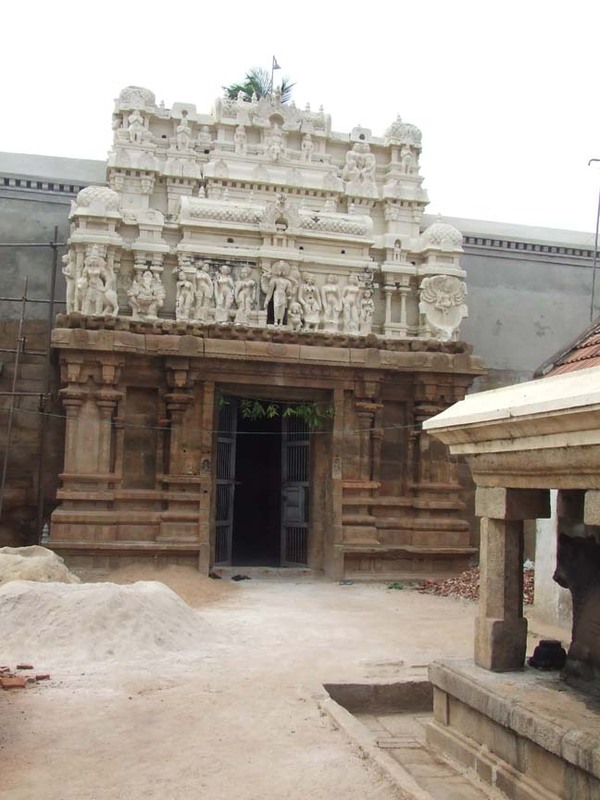 The corbels above the pillars are heavy with vettu and taranga in it. The heavy corbels hold the connecting beam that runs above the row. The faces of the pillars are adorned either with circular flower motifs or with miniatures. 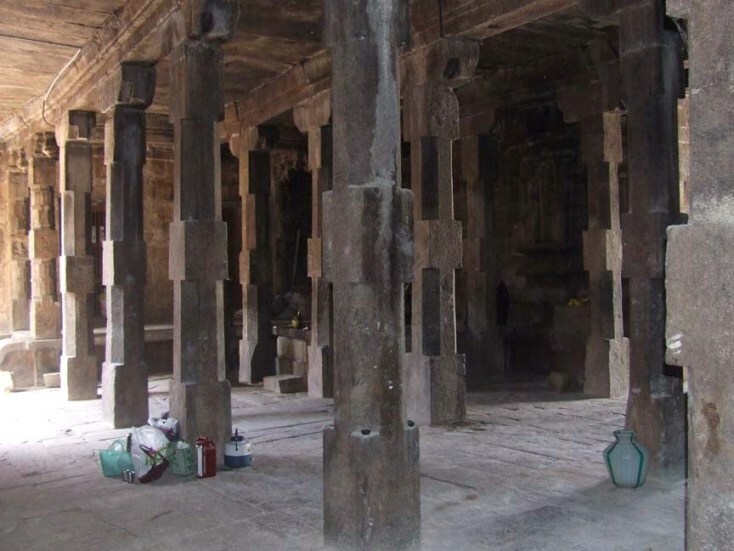 Some pillars are very ornate and decorative which are seen on the middle of the mandapa. Among these pillars some are single and some are double. 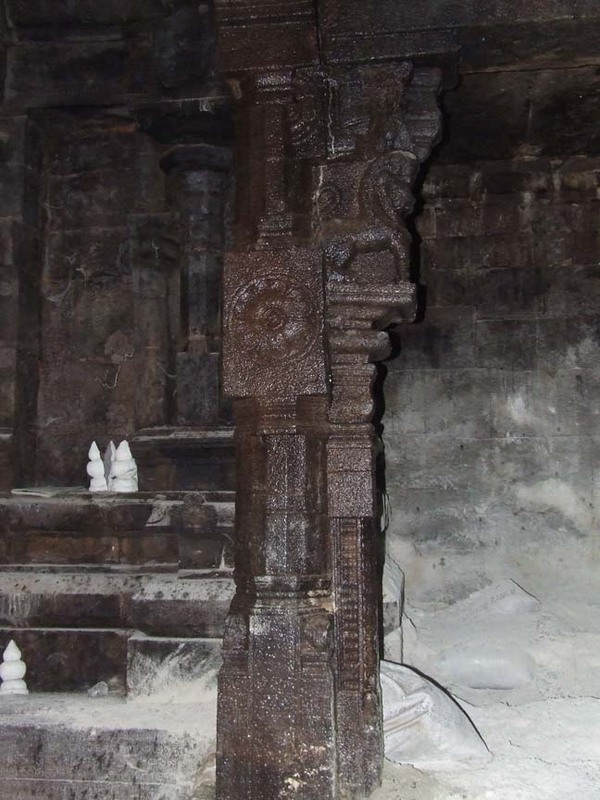 Unlike the simple pillars of southern side the potikas of ornate pillars are shown as madalai with nanudal. The corbels of each row of pillars hold the beams, and above the beams are shown the vajana and valabhi. 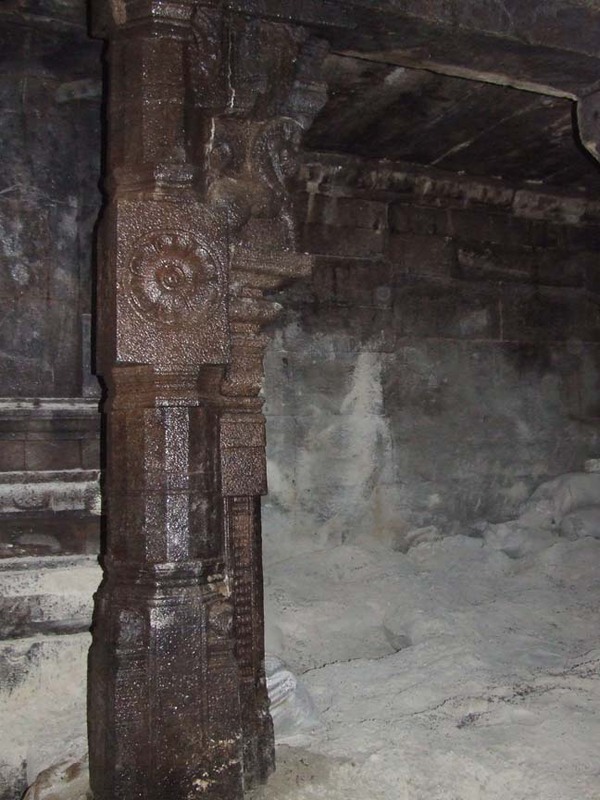 Stone slabs are arranged above the beams to cover the mandapa. On the north eastern side of the mandapa the Navagriha is seen on a raised platform. And the saptamatrikas accompanied by Ganesa and veerabadra are seen on the southern side thiruchuttru malika. 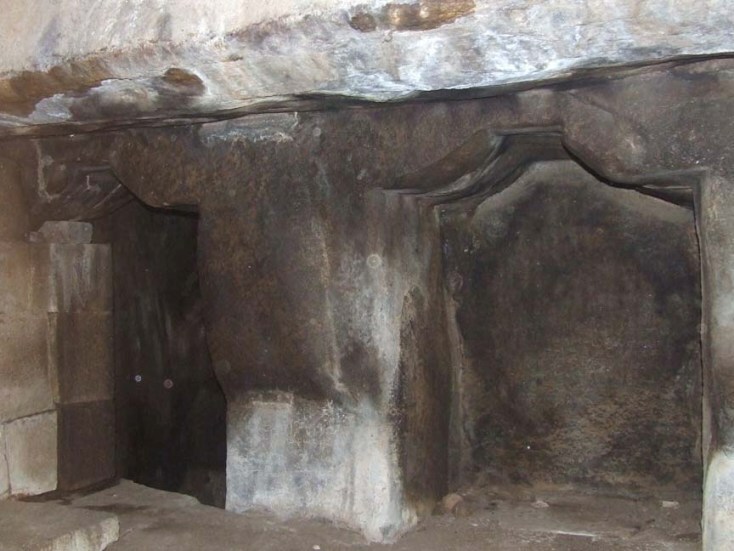 Two unfinished caves are found on either side of the Parvathagiriswara rock cut cave. These two unfinished caves are located in the space between the ambulatory wall and the wall enclosure of the inner mandapa ends. The unfinished cave on the north is 2.77 mts in north south direction, 2.07 mts height and an average depth of 1 mt. Pillars are shown in the facade. The rough rock brow extends as kapota. Loose sculptures are kept here. On the facade left sidewall is seen a bas-relief sculpture of Chandeswara. 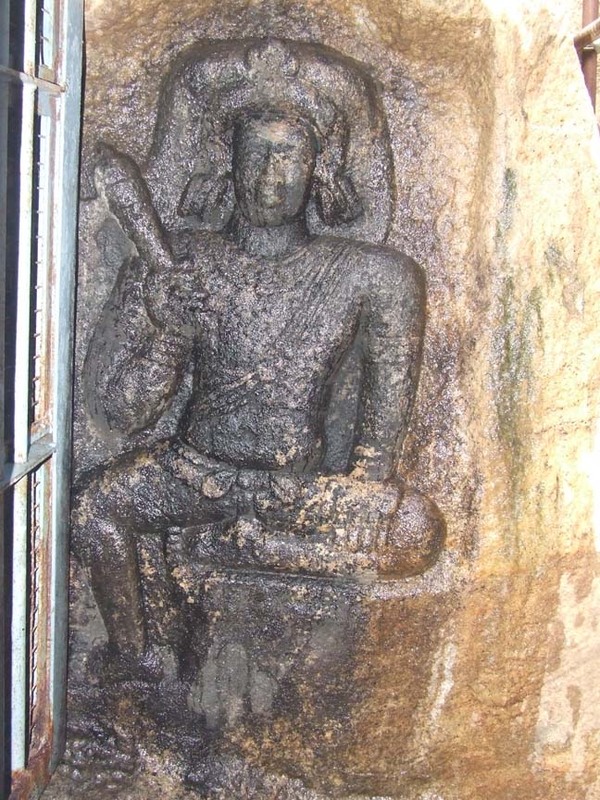 Seated in suhasana with left hand on the thigh and right hand holding the axe. Wearing a half dress with knot in the center, head is decorated as jatabara, yajnopavita worn in upavitha fashion, bangles, armlets, charapalli, udarabanda, patrakundala are the ornaments found. The unfinished cave on the south is bigger in size comparing to the north. The wall enclosure of the inner mandapa splits the cave into two and makes unidentified. It has a facade with two pillars in the middle and two pilasters each one on either side. The pillars and pilasters are not fully formed with its hind portion remaining incomplete. Above the pillars potikas are shown which are angular in type. The southern most chamber is 1.98 mts height, 1.96 mts depth and 1.19 mts width. The middle chamber is .86 mts depth, .70 mts width and 1.37 mts height. 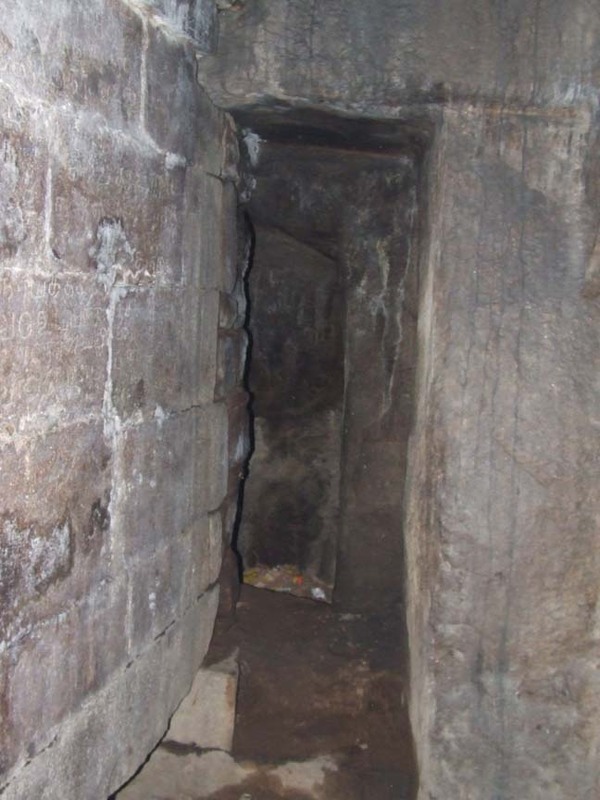 The northern most chamber which comes inside the inner mandapa is 2.03mts height and 1.96 mts depth. Comparing with the corner chambers the middle chambers height is reduced due to the later constructed flooring. The rear wall of the attempted cave is full of inscriptions. Dear readers, hope you have enjoyed this session and bye for now and in the next session we will see about the central theme of this virtual tour.